**** Chosen by Winner: Brandon C.
This AD-15MG model sports a Flat Dark Earth G-10 handle and a two-tone blade with stonewashed flats and satin grinds. 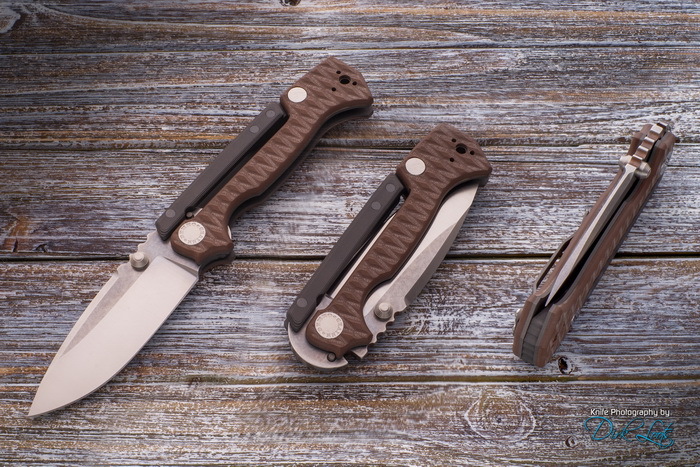 The Demko Knives AD-15MG offers a mid-tech version of Andrew Demko's innovative custom design. It comes equipped with the Demko designed Scorpion lock that provides rock solid lock up. Andrew modified a traditional lockback design by integrating it into the handle and adding a stop pin, eliminating blade play and overtravel issues. The heavy duty titanium frame handle has G-10 scales for a comfortable and secure grip. A titanium pocket clip and backspacer round out this unstoppable Demko design.